Jens Jäger, who skipped Germany to a bronze medal at the 2009 Wolds, and also skipped at the Vancouver Paralympics, is out of the national team. He has been replaced by his 3rd, Marcus Stieger. 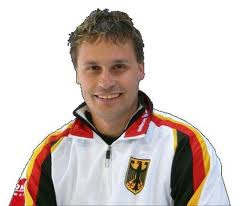 The new Team Germany, who will compete at the 2011 Worlds in Prague, is Marcus Sieger (Skip), Jens Gäbel, Christiane Steger and newcomer Stefan Deuschl. Helmar Erlewein continues as national team coach. Jens has a new team, the Mainhattan Ice Wheelers, who competed in last weekend's Danish international spiel at Taarnby, finishing fourth. Congrats to Marcus, he is a great guy.